U.S. auto sales jumped 11 percent in January, led by huge gains at Chrysler Group and Volkswagen of America.Automakers sold 913,284 light vehicles for the month, the best January since 2008. The seasonally adjusted annual selling rate was 14.2 million, which matches the cash-for-clunkers selling rate of August 2009. Toyota Division General Manager Bob Carter said January had “a very healthy” sales pace. — All major players posted sales gains except General Motors, which fell 6 percent from a strong January 2011 that had been buoyed by strong incentives. — All four GM brands lost ground: Chevrolet was down 1 percent, GMC lost 10 percent, Buick 23 percent and Cadillac 29 percent. — Chrysler Group volume jumped 44 percent to 101,149 units. The growth was led by Chrysler brand, up 81 percent. — Hyundai-Kia Automotive gained 20 percent overall: Kia rose 28 percent and Hyundai 15 percent. — Nissan North America sales increased 10 percent, just under the industry average overall. But after being passed by Hyundai-Kia for the No. 6 U.S. sales position, Nissan’s 79,313 light-vehicle sales gave it a 1,102-unit lead over its South Korean rival to start the year. — American Honda gained 9 percent in January, its first year-over-year increase since April and a sign that its restocking efforts since the March earthquake and tsunami in Japan and flooding later in the year in Thailand are working. — Toyota Motor Sales, which also had been slammed by the natural disasters last year, boosted sales 8 percent to 124,540 units. Toyota brand rose 9 percent, offsetting a 5 percent decline at Lexus. — Ford Motor Co. increased sales 7 percent in January, with Ford division up 8 percent and Lincoln down 8 percent. — Among the smaller players, Volkswagen Group sales soared 40 percent to 36,681 units, led by a 48 percent increase for the VW brand and 20 percent higher sales at Audi. — Mazda posted an even bigger gain, up 68 percent to 23,996 vehicles. — Subaru volume rose 21 percent, its second month of growth after a seven-month stretch of declines as it struggled to restock U.S. dealer lots after the natural disasters of last year. — Daimler AG gained 23 percent, with 23 percent growth at Mercedes-Benz and 39 percent at Smart. — BMW group sales rose 6 percent overall, with a 21 percent increase at Mini pumping up a more modest 3 percent gain at BMW brand. — Other European premium brands posted increases: 31 percent for Jaguar Land Rover, 6 percent for Porsche and 4 percent for Volvo. — Only two small Japanese automakers posted sales declines in January. Mitsubishi’s volume fell 18 percent while Suzuki tumbled 41 percent to 1,505 units. — Tough sledding for luxury: A few luxury brands outperformed the industry’s 11 percent rise in January. Land Rover jumped 41 percent, Mercedes-Benz gained 23 percent and Audi 20 percent. But Jaguar, Porsche, Acura and BMW eked out modest unit increases below the industry average. And Lexus fell 5 percent, Lincoln and Infiniti each lost 8 percent, and Cadillac tumbled 29 percent. — The industry’s shift to greater North American production continues. U.S. sales of vehicles made in the United States, Canada and Mexico were 77.9 percent of total industry volume, up from 76.7 percent last January. — Oddity: Audi outsold Cadillac in January, 9,354 units to 8,924. Until Cadillac can get its new XTS and ATS sedans into showrooms, it is limited to essentially three models: the CTS sedan and SRX and Escalade SUVs. — Best-seller surprises: Compared to the 10 best-selling nameplates for 2011, January’s top 10 list has three new names. The Honda Accord and Ford Fusion dropped out, but Honda added the Civic and CR-V. And the Chevrolet Cruze got bumped by its big brother, the Chevy Impala. — Guess who’s No. 2? One other Top 10 shakeup: The new-generation Toyota Camry, introduced in September, outsold the Chevy Silverado pickup, ousting it from its perennial No. 2 sales position behind the Ford F-series. — Trucks bucked: January also changed the list of 2011 best-selling trucks. Out: 2011’s No. 7 GMC Sierra and No. 10 Kia Sorento. In: the Jeep Grand Cherokee at No. 7 and Nissan Rogue at No. 9. — Cars rule in January: Cars outsold light trucks last month, 474,449 to 438,835, a 51.9/49.1 split. A year ago trucks ruled, 413,962 to 405,924, a 50.5/49.5 split. It’s time to readjust expectations based on the most common industry sales measurement: comparing sales to performance the year before. — Hyundai-Kia and Chrysler are coming off 2011 performances up more than a quarter, so it will take huge months for them to move the needle much this year. — Both Toyota group and American Honda sales fell 7 percent in 2011, so posting even modest increases will look good this year. — Sales comparisons also will be easier for Ford and GM this year because the drag of those dead or sold brands has washed out of year-ago numbers. For GM, no more year-ago sales of Pontiac, Saturn, Hummer or Saab models. Ford has no Volvos and only a wisp of Mercury sales on the 2011 blotter. Though gas prices continue to fall and are estimated to drop even more in the next few months through year-end, Edmunds.com data released Tuesday reflects that consumers are still more likely to purchase smaller gas sippers than take on an SUV or truck. According to the company’s analysis, shoppers are still leaning towards compact or subcompact cars as a result of higher than average gas prices. High gasoline prices have caused a realignment of buyer priorities and almost unprecedented demand for small cars, just in time for the launch of a stable of tech- and content-rich new models,” explained Edmunds’ AutoObserver.com senior editor Bill Visnic. Besides economic factors, Edmunds.com reports that increasing options in the small car segment are also driving consumer interest. “More options in the small car segment are drawing in more consumers,” stated Edmunds.com analyst Jeremy Acevedo. “The Chevy Cruze, Fiat 500, Ford Focus and Hyundai Elantra are among the small cars that are stimulating interest,” he added. Though more options and new 2012 small-car models are becomings increasingly attractive to consumers, the bad news is “as demand goes up, inventory and incentives fall,” company officials noted. According to Edmunds.com’s True Cost of Incentives data, the national average incentive for the compact car in August was $864, down 63 percent from $2,318 in August 2010. Moreover, subcompact car incentives in August averaged $520 per vehicle sold, down 57 percent from $1,211 in August 2010. However, if consumers are willing to delve into less popular segments, such as mid-range luxury cars, they may find better savings packages. Edmunds.com data reports that the national average True Cost of Incentives for this segment came in at $4,228 in August 2011. Breaking the trend seen throughout August down further, for cities, Atlanta saw the highest rate of increase in compact car shopping as it rose 41 percent from 2010. Subcompact car shopping also increased by 35 percent year-over-year in Georgia’s capital city. Boston followed close behind, with August compact car shopping rising by 28 percent versus 2010, and the rate of subcompact car shopping in rose a significant 59 percent year-over-year. Also of note, as the compact and subcompact segments continue to gain popularity, they are also becoming more profitable for dealers and OEMs, AutoObserver.com’s Visnic reported. For example, Hyundai Motor America’s chief executive officer John Krafcik recently noted at a media event the new Elantra is selling for an average of $4,000 more than the previous-generation model. Moreover, AutoObserver.com reported that Don Johnson, General Motors vice president of U.S. sales, pegged the rise in the new Chevrolet Cruze’s average transaction price at $4,000 more than the Cobalt that preceded it. “Auto-company executives wishing for increased small-car supply in the U.S. happens about as frequently as an appearance of Hailey’s comet, but with prices reaching new highs and almost no incentives required, compact cars are the auto companies’ new BFFs,” Visnic explained. DETROIT — The Detroit 3 posted double-digit U.S. sales gains in August in the face of forecasts that industry demand would cool. General Motors had an 18 percent gain and Ford Motor Co. was up 11 percent — their biggest jumps since April. Chrysler Group, with a 28 percent rise, now has had increases of 20 percent or more in six of the year’s first eight months. Volkswagen brand was up 10 percent and Nissan North America rose 19 percent, despite a drop at Infiniti. American Honda and Toyota Motor Sales, which have dragged down the industry since May because of vehicle shortages stemming from the March earthquake in Japan, have yet to report. Subaru, which has also been crimped by tight supplies, posted a 6 percent decline, its fourth straight monthly drop. Analysts said August, like the past few months, would fall short of the sales pace set at the start of the year. They cited a decline in consumer confidence and dimming prospects for strong economic growth. And Hurricane Irene paralyzed most of the Eastern seaboard last weekend, leaving flooding and power outages in its wake. GMC led GM brands with a 41 percent jump over August 2010. Chevrolet rose 16 percent and Buick was up 12 percent. Cadillac was up 4 percent after three consecutive monthly declines. GM said the Chevrolet Cruze topped 20,000 sales for the fifth straight month. The new entry was helped by lingering shortages of small cars at Toyota and Honda. Chrysler continued to benefit from the performance of its Jeep brand, which was up 58 percent in August and is up 50 percent for the year. Chrysler ran a no-payments-for-90-days promotion for some buyers of 2011 and 2012 Chrysler, Jeep, Dodge and Ram models during the month. Ford-brand sales rose 16 percent. Lincoln, up 25 percent, rose for the third straight month following six straight months of decline. Prior to today’s reports, August sales were projected to run at a 12.1 million seasonally adjusted annual rate, according to the average estimate of 14 analysts surveyed by Bloomberg. The pace averaged above 13 million through April of this year and dropped below 12 million in May and June before rising to 12.2 million in July. “With the economic woes, summer vacations and Hurricane Irene taking center stage, August may be a lost month for vehicle sales,” said Jeff Schuster, executive director of global forecasting at J.D. Power and Associates, in a statement yesterday. J.D. Power’s SAAR forecast for July was 11.9 million units, saying demand dropped sharply in the second half of the month as consumers waited for bargains and bad weather took over. Toyota showed off its all-new Camry on Tuesday, aiming to recover lost sales momentum with price cuts and a high-powered ad campaign for its flagship sedan that remains America’s best-selling car. Sales of the Camry are down 8 percent this year but it is still No. 1 in the United States despite market-share gains by mid-size rivals the Nissan Altima, Ford Fusion, Chevrolet Malibu and Hyundai Sonata. Losing sales this year has been the Honda Accord, which has fallen to No. 4 among mid-size cars from its No. 2 position in 2010. The launch of the new Camry comes at a time when Toyota is struggling to shake free of the damage from costly safety recalls and the more recent problems caused by production shortages after the March earthquake. The Japanese automaker has seized on the redesigned Camry as a symbol for its own return as a force in the U.S. market. Toyota unveiled the 2012 Camry with unusual fanfare at events staged in Detroit, Los Angeles and New York that featured a live video link from a plant in Kentucky where President Akio Toyoda drove the first production vehicle off the assembly line. Camry’s U.S. sales peaked in 2007, as Toyota extended a lead over GM in global auto sales. That was also the first year of the current generation of Camry.Some 15 million Camrys have been sold worldwide since it debuted in the U.S. market in 1983. It has been the top-selling car in the U.S. market for nine years running and 13 of the last 14 years according to Toyota. Overall, U.S. Toyota sales fell 7 percent through July for the No. 3 spot behind GM and Ford. Most of its competitors gained, led by Hyundai with a sales increase of 23 percent. The Camry’s reputation for worry-free reliability made it a favorite of a generation of American consumers now entering or already in their retirement years. The average age of the U.S. Camry buyer is 60, which the automaker hopes to lower with the 2012 model, the sedan’s seventh generation. The mainline gasoline-powered sedans will begin showing up at U.S. dealers in early October, ahead of an October 17 launch of an advertising campaign that will climax during the early 2012 Super Bowl broadcast, said Carter. Hybrid versions of the Camry will be at U.S. dealerships by December. Among competitors, the new Chevrolet Malibu goes on sale in early 2012 followed later in 2012 by new versions of Honda’s Accord and Nissan’s Altima. Earlier this month, General Motors said it expected Toyota and major Japanese automakers to be “back with a vengeance” in the U.S. auto market as they are able to recover from the March earthquake. A sign of that may be the pricing of the 2012 Camry lineup. Of the six versions of the Camry, five will have lower prices than their 2011 counterparts, which Toyota executives say is partly because of the intense competition in the mid-size sedan market. While Camry prices are lower, fuel economy ratings are higher, led by the Camry Hybrid LE, the lower-priced of two hybrid offerings. It will get a combined city and highway average of 41 miles per gallon. The four-cylinder gasoline models will get a combined 28 mpg. Toyota Motor Corp. and Honda Motor Co. are speeding returns to normal production after the March 11 earthquake and tsunami idled factories and created shortages of parts. The slowdown in May sales came about because limited supply of fuel-efficient cars like Toyota’s Prius lifted prices and curbed purchases. U.S. sales of cars and light trucks may rise to 13 million this year, the average of 16 analysts’ estimates compiled by Bloomberg. That would be the most since 13.2 million in 2008. Average U.S. gasoline prices dropped for 14 straight days since May 11 to $3.80 a gallon for regular unleaded, according to AAA. Prices earlier in May were at the highest level since 2008, reducing demand as the country’s vacation season started. The earthquake in Japan may result in 3 million to 3.5 million units of global production that will be lost or deferred into next year, according to researcher IHS Automotive. 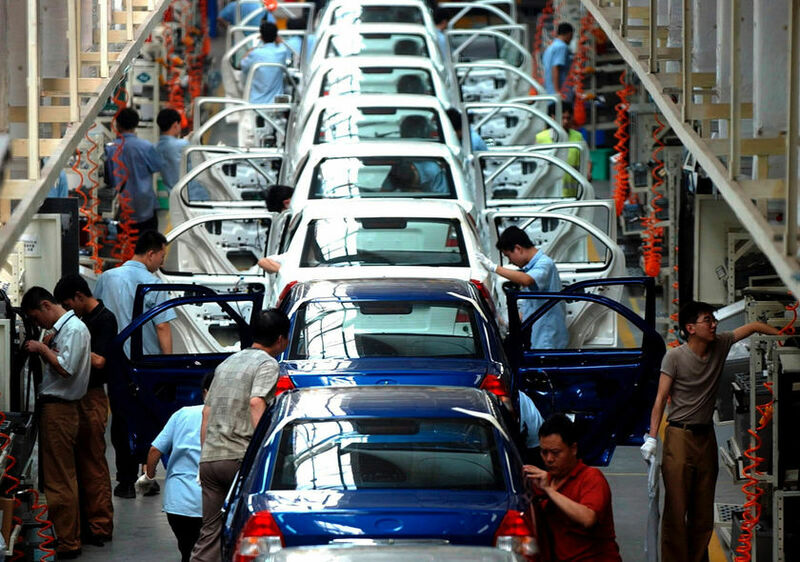 Worldwide light-vehicle production may rise to 73.7 million units this year from 71.9 million in 2010, according to IHS. Toyota, which built 45 percent of its cars in Japan last year, may lead declines among major automakers with a 27 percent drop in May deliveries, the average of three estimates. Honda Motor Co., the second-largest Japanese automaker by U.S. sales, may say sales fell 25 percent, the average of three estimates. Nissan Motor Co. deliveries may decrease 7.3 percent, the average of three estimates. Automakers benefiting from their Japan-based rivals’ supply constraints may be led by Hyundai Motor Co. and Kia Motors Corp. Their combined U.S. sales may pass Toyota for the first time, according to Santa Monica, California-based TrueCar.com. Deliveries for Hyundai and Kia may surge 43 percent in May to 115,434, behind only General Motors Co. and Ford Motor Co., according to the auto pricing website. Toyota, the world’s largest automaker, has said it expects production in North America to return to about 70 percent of normal levels beginning in June, from about 30 percent in May. Honda forecast last week that North American production will return to 100 percent in August for all models except Civic small cars, and said May 17 that global production will return to normal before the end of the year.